Tag line: "The power behind the throne"
My parents took my brother and I to see the 1980 comedy Nine to Five during its theatrical run, and as I remember it, the theater was fairly packed. It was a good crowd too, because everyone was laughing at the right moments, and at the end, the entire audience cheered. Turns out that was the reaction most of the country had to this film: Nine to Five was a box-office hit, and, adjusted for inflation, ranked as the 20th highest grossing U.S. Comedy of All Time in 2005, beating out movies like Austin Powers in Goldmember, Stripes, and Trading Places. Recent divorcee Judy Bernly (Jane Fonda), who’s heading to work for the first time in her life, has landed a job as a secretary at Consolidated Companies, Inc. On her first day, Judy is shown the ropes by Violet Newstead (Lily Tomlin), a longtime employee who, along with going over what her duties will be, fills Judy in on all the office gossip, including the rumor that their boss, Franklin Hart (Dabney Coleman), aka the “Sexist Egotistical Lying Hypocritical Bigot”, is sleeping with his secretary, Doralee Rhodes (Dolly Parton, in her big-screen debut). It doesn’t take long for Judy to understand how things work at Consolidated. For one, co-worker Maria (Roxanna Bonilla-Giannini), who desperately needs the job, is abruptly fired for a minor infraction. What’s more, the much-deserving Violet is once again passed over for a promotion, which is given instead to a male co-worker she herself trained! To top it off, Doralee hears about the rumors that she’s been banging the boss (which are untrue), and is further annoyed when she learns Hart himself is the one who’s been spreading them. Pushed to their breaking point, Violet, Judy, and Doralee get drunk together one evening, and share fantasies of how they’d go about killing Mr. Hart if they ever got the chance. But the next day, when Violet accidentally pours poison into Mr. Hart’s coffee, it kicks off a series of events that might just land the three pissed-off secretaries in jail… for life! 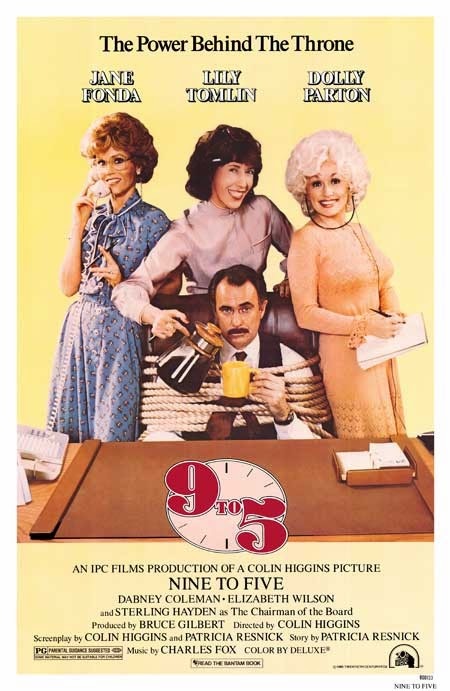 By the time they made Nine to Five, both Jane Fonda (a two-time Oscar winner, for her work in 1972’s Klute and ‘79’s Coming Home) and Lily Tomlin (nominated for her role in Robert Altman’s 1975 ode to country music, Nashville) were established stars, and each delivers a fine performance. Fonda perfectly captures the naiveté of a woman who’s never held a job before, reacting strongly to injustices that, over time, the other women have learned to take in stride, while Tomlin’s oft-overlooked Violet, who’s clearly the most experienced worker in the secretarial pool, has reached the point where she realizes that, no matter how hard she tries, she’ll never advance as long as Mr. Hart is her boss. The true revelation, however, is the performance of Dolly Parton, who, despite having never appeared in a motion picture, holds her own with her two experienced co-stars. Each actress is given a chance to shine (the scene where Doralee confronts Mr. Hart, telling him she carries a gun in her purse, and that if he continues to spread rumors about her she’ll turn him “from a rooster to a hen with one shot”, got one of the biggest laughs from the crowd I saw it with in 1980), but the sequence where the three are together, fantasizing about killing Hart, is arguably the film’s best, with each fantasy presented as if it were a scene from a movie (Violet’s dream of poisoning Hart is designed to look like a Disney picture, complete with woodland creatures helping her pour the toxic chemical into the coffee cup). Dabney Coleman, who, in the early ‘80s, made a career out of playing slimeballs, is particularly loathsome as the conniving Mr. Hart, and Sterling Hayden has a memorable cameo as Consolidated’s Chairman of the Board, Russell Tinsworthy, but from start to finish, Nine to Five belongs to the ladies.